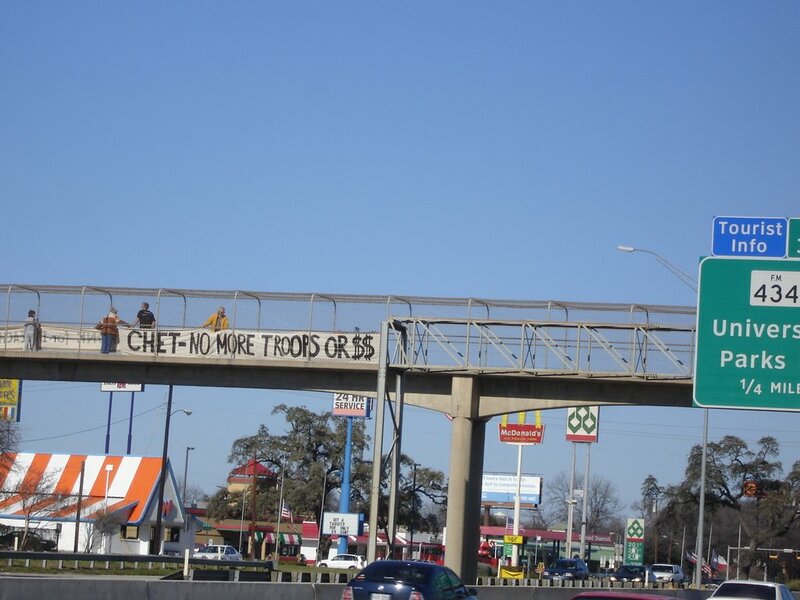 After the protest at Chet Edwards office on Jan 12th, we sustained the momentum on Jan 21st with another live freeway blog at the I 35 pedestrian overpass. Onward to D.C. on Jan 27! 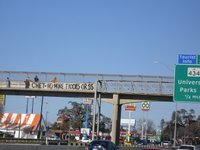 On the freeway our messages were: "Chet--no more troops or $$." and "Honk for impeachment." Thanks to the half a dozen dedicated activists who spent 2-3 hours spreading the word. An estimated 27,000 travelers read our messages. However, we had 3 challenges to our presence and voices that day. A group of college students asked what did we expect to accomplish--suggesting silence and apathy were the more patriotic approaches. 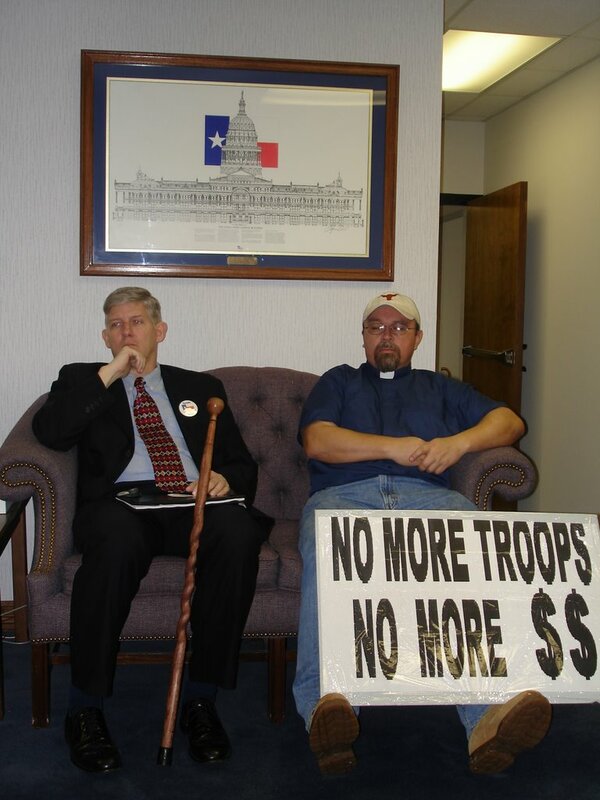 They were very gung-ho about the Iraq war--until we asked them why they were not serving in Iraq. Suddenly, they denied being such fervent supporters of the occupation. Next, 2 aggressive young men asked how dare we protest at a time of war. 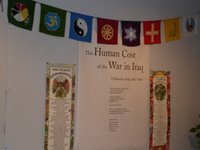 When I quietly asked about the First Amendment rights we are reportedly defending by invading Iraq--the response was profanity and the ripping of one of our banners. Finally, a local citizen did not agree with our message and summoned the police. We were told that we could not be there with our banners. We held our ground and insisted to see the actual law or regulation that prevented our presence there. Eventually a supervisor arrived and admitted in fact that the law only prevented tying signs to the overpass. Thus we stayed and plan to return. 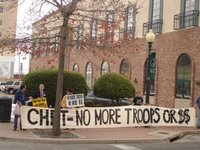 We observed it's not necessary to travel to Iraq to defend our American rights--we must struggle right here in Waco to preserve them. March on Washington Jan 27-29, 2007.
no more $$" and requested a conference call with the Congressman. Although his office was very polite, we were told Mr. Edwards was on the floor of Congress and could not talk with us. We were also told a meeting would be arranged; we will see if that does happen. We presented a letter to Mr. Edwards signed by about 30 of his constituents which was faxed to the Washington office (see below.). Our main points were: 1)the Iraq invasion and occupation are illegal and immoral, 2) over 650,000 Iraqis and 3000 Americans have died as a result of Bush's lies 3)the proposed escalation is opposed by the American people, the Iraq Study Group, and most U.S. generals , 4) we called on Mr. Edwards to vote for resolutions against the escalation, and to vote only for enough funds to rapidly bring our troops home from Iraq. The action was very successful in our view. 3 of 4 major local media outlets provided some coverage. AND, one television channel showed a statement from Edwards that seemed to address our presence on Friday. Hopefully, it will plant a seed in his mind to reconsider his continued hawkish support of Bush's disastrous course in Iraq. Thanks to every peace activist who gave their time and energy to the action, and to all those who could not be present but support the effort in many ways. 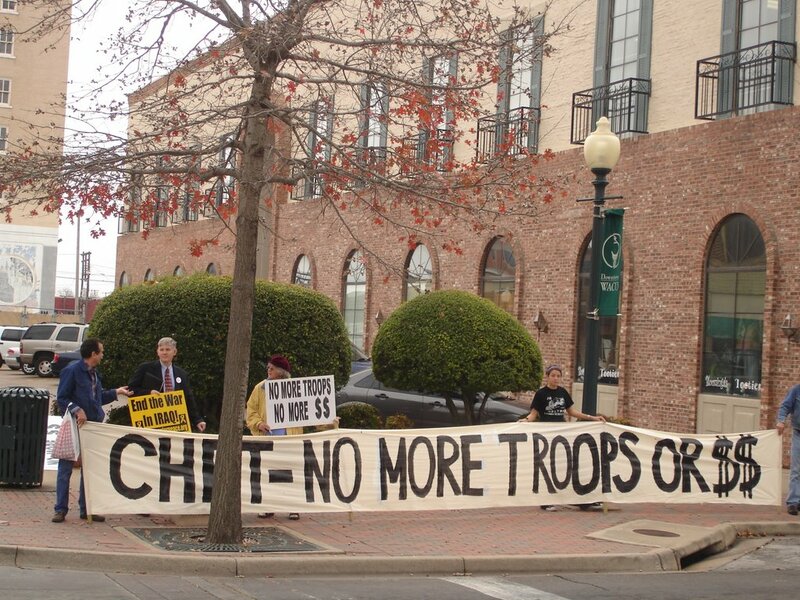 As your constituents from the Waco area, we request that you work toward rapidly removing our troops from Iraq. Seventy percent of Americans and 78% of Iraqis support redeployment of American troops from Iraq. The polls clearly show that the public’s rejection of the Bush Iraq policy is the main reason for the Democratic Party’s takeover of Congress in November 2006. Therefore, it is time for you and the entire Democratic Party to heed the wishes of the majority. Although a just domestic agenda is admirable, extracting the U.S. from Iraq remains the number one priority of Americans. 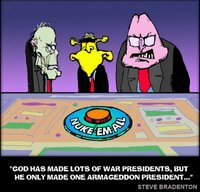 Furthermore, 88% of Americans and most generals are opposed to another escalation of the war as now proposed by Mr. Bush. The invasion and occupation are illegal, a violation of the UN charter against invasion of a sovereign country without Security Council approval or an imminent threat. The war has been waged for U.S. oil companies, revenge and hegemony, not because of WMD or an Iraqi connection to 9/11 or terrorists. Legitimate efforts to combat terrorism have been harmed. Our own National Intelligence Estimate has reported that the war is creating more terrorists. The massive human cost is approximately 650,000 Iraqis dead, over 3.000 Americans dead, about 50,000 Americans injured, about 1.7 million Iraqis displaced. At an estimated cost to taxpayers of $500 billion, the U.S. will spend $1 million for each Iraqi death. The reputation of our country has been damaged throughout the world. We are viewed as aggressors and torturers. · Vote against escalation of the war, and approve only sufficient funds for redeployment of our troops. · Establish a timetable for orderly, rapid withdrawal of our troops. · Utilize funds to help reconstruct the damage that has resulted from our occupation. 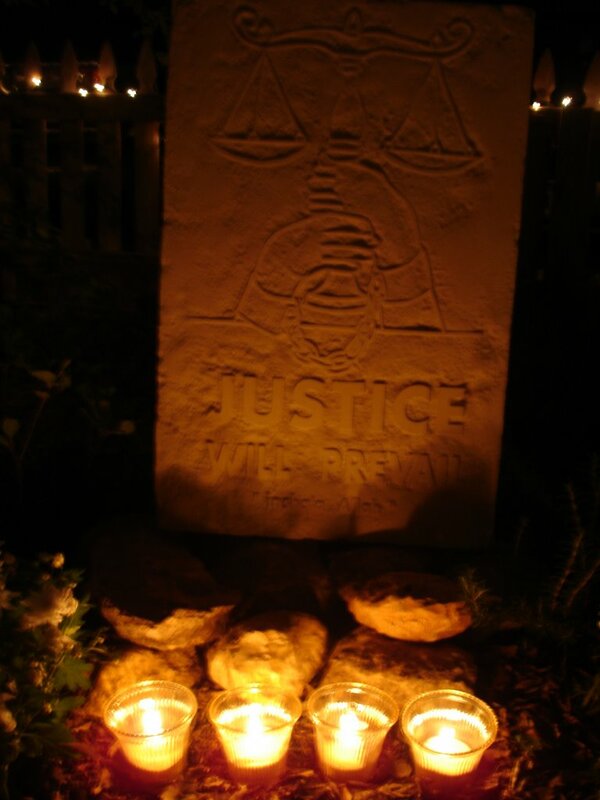 · Vote to end all torture, secret and illegal detention, extraordinary rendition and illegal surveillance. We realize that you are a strong supporter of the military. Ending this unnecessary war will also be beneficial in restoring the morale and strength of the armed forces. 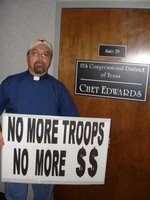 HAND DELIVERED TO MR. EDWARD’S OFFICE, 600 AUSTIN AVE. WACO, TX, JANUARY 12, 2007. 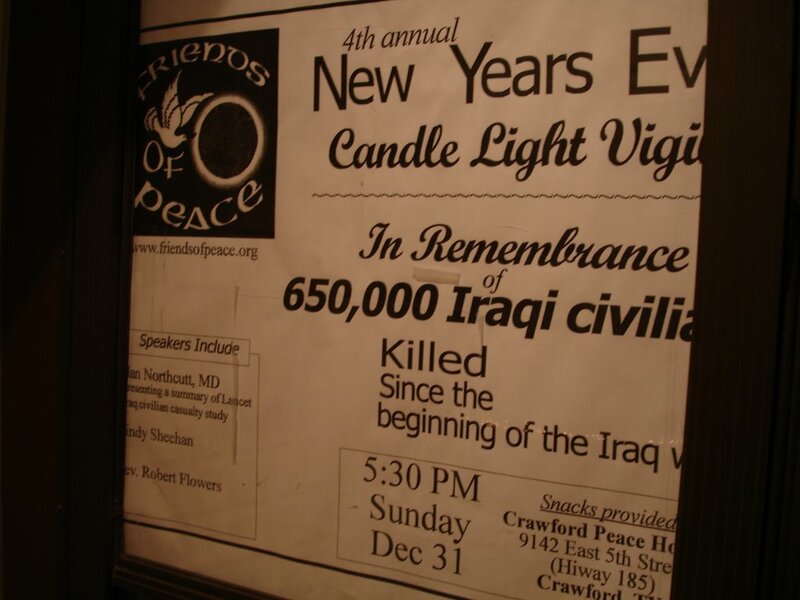 January Film: Iraq for Sale: The War Profiteers. DATE: Thursday, January 11, 2007 (note 2007 films 2nd Thursday). TIME: 6:00p.m. free pizza buffet, drinks paid by guest. 6:30 film and discussion. PLACE: Poppa Rollo's Pizza, 703 N. Valley Mills, Waco. mtg. room outside and inside entrance. NOTE: December film was standing room only, suggest arrive early for limited seating. FILM: Release 2006; 75 minutes. Unrated. Acclaimed direct Robert Greenwald (Wal-mart; Outfoxed) takes you inside the lives of soldiers, truck drivers, children, and widows whose lives have been changed forever as a result of profiteering in the reconstruction of Iraq. 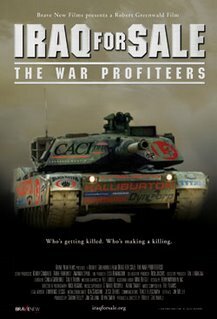 The film uncovers the connections between private corporations making a killing in Iraq and the decision makers who allow them to do so. 70% of Americans and Iraqis want US troops out of Iraq. The US voters made their opposition to the war very clear on Nov. 7. Only 12% of Americans support Bush's likely escalation of the war. Many US generals oppose escalation. So why is that likely to happen? One reason is the tremendous profits of Halliburton, CACI and others, and the power of the military-industrial-congressional complex. Come learn about war profiteers at this critical juncture in US history. Friends of Peace strive to bring you the latest in thought provoking progressive films usually not shown in Waco theatres, and often not available at all in this area. Your presence is greatly appreciated and helps maintain a forum for progressive thoughts and values in Waco. perished since the United States invaded in March 2003. 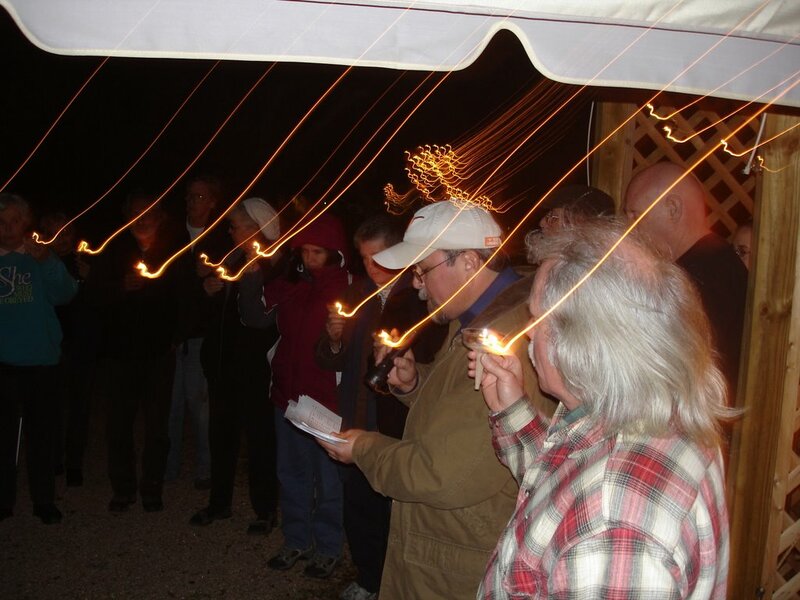 The event was held at the Crawford Peace House (thanks for their hospitality) at 5:30p.m. on New Years Eve. We were truly honored at the presence of so many friends--the house was full; it was standing room only. A local physician presented details of the JohnHopkins study on Iraqi casualties that was published in The Lancet in October of this year. The most stunning finding: with 95% certainty, the number of excess Iraqi deaths (as a result of the US occupation) is from 400,000-900,000. Rev. Robert Flowers, a local Methodist minister and long time peace activist, gave a moving presentation on the death of Iraqi children in this war. We were then honored to have an Iraqi gentlemen discuss the Iraq occupation and civil war from his first hand knowledge--and he confirmed the accuracy of the Johns Hopkins study. 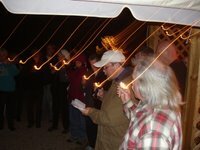 The crowd was then further inspired by the words of peace activist and leader Cindy Sheehan. Her accounts of experiences in Jordan , breadth of knowledge, and enthusiasm to "Surge for Peace" were great. A short ceremony dedicated a stone monument which stated in Arabic "Justice will prevail if it be God's will." Rev. Flowers (photo with cap) led a touching candlelight ceremony which included the reading of names and demographics of Iraqis who have died in this illegal war. Snacks and conversation followed. 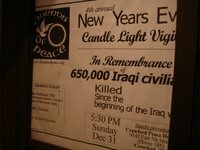 Although the thousands in the US media and millions of US citizens have ignored the human cost for Iraqis of this occupation, our small group was sincere in its effort to commemorate the Iraqi dead, and to confirm that each Iraqi life is as important as an American life.